Astronomers found a pulsar hurtling through space at nearly 2.5 million miles an hour—so fast it could travel the distance between Earth and the Moon in just 6 minutes. The discovery was made using NASA's Fermi Gamma-ray Space Telescope and the National Science Foundation's Karl G. Jansky Very Large Array (VLA). 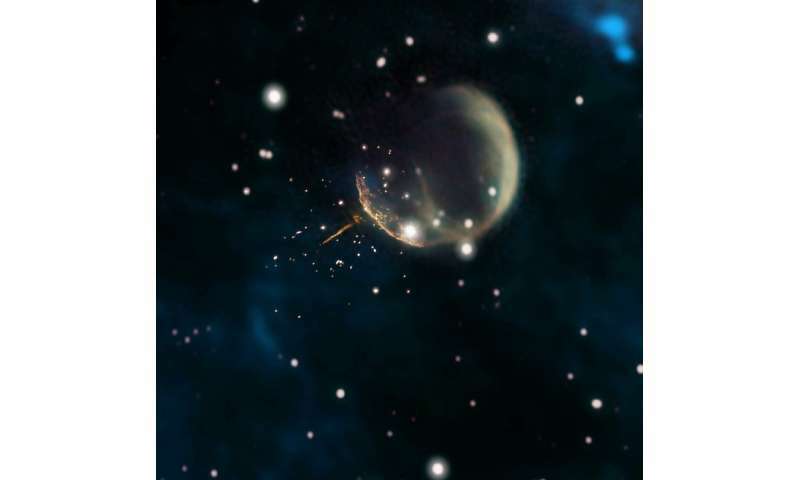 At first, the supernova's expanding debris would have moved outward faster than J0002, but over thousands of years the shell's interaction with interstellar gas produced a drag that gradually slowed this motion. Meanwhile, the pulsar, behaving more like a cannonball, steadily raced through the remnant, escaping it about 5,000 years after the explosion. The team plans additional observations using the VLA, the National Science Foundation's Very Long Baseline Array (VLBA) and NASA's Chandra X-ray Observatory. That is clearly a Shkadov thruster or a Bowl of Heaven. A luxurious way to gallivant around the galaxy. That's clearly a galaxy-sized assumption. An explosive supernova stellar birth, this stellar tadpole will one day be a full-fledge star. Dang observicist It was just a joke :(. I mean I thought for sure that by saying "gallivant around the galaxy" it would be clear to anyone that it was in jest. Galaxy forbid any one have a little fun. You have to admit it does share a visible resemblance to the hypothetical star ship. Take a ride on the Wabash Cannonball...ya right! But if they are traveling that way they are likely not merchants as there would be no 'return market'. What if one of these massively-fast pulsars speeding through space is currently in collision course with our solar system? Uhh, just too damn bad? Reality gets the last laugh on us monkeys? Start digging a really deep foxhole? If it is the Wabash Cannonball Express? No amount of "study" will allow these plasma ignoramuses to determine how these explosions are able to "kick" stars to these velocities. Clearly the star was part of the "supernova" event. This is observational evidence of the birth of a newborn star from a parent star, an explosive birth of a new star. Stop making up idiotic nonsense. Go get an education. Given human eyewitness testimony, a similar type event already occurred in our solar system. No it did not. Stop lying. Velikovsky's book 'Worlds in Collision' described a very similar event, a story corroborated worldwide by many disparate cultures. Although some of Velikovsky's details of the events are likely not correct the myths and religions that arose soon after these events have been the basis of culture worldwide. Velikovsky was a loon. Nothing he wrote is of any relevance to science. Or anything else, for that matter. The book was laughable. The amusing thing, the scientific community (Sagan, et al.) attempted to castigate Velikovsky and show his claims to be false. Their attempts failed miserably and they ended up with egg on their face. Sagan feebly apologized for this inquisition and admitted what a sorry bunch of people the scientific community really are. No, he did not. And Velikovsky was wrong about everything. Sagan's mistake was giving the clown the oxygen of publicity. He should have just been ignored. As he is by anybody even vaguely scientifically literate. He was an idiot. Sagan's mistake was giving the clown the oxygen of publicity. He should have just been ignored. As he is by anybody even vaguely scientifically literate. He was an idiot. Sagan's comments which are the opposite of jonesdumb's. According to Sagan, jonesdumb is a religionist. And it would seem as if jonesdumb has officially devolved into a Captain Stoopid type of stalker troll. What are you talking about, you clown? Velikovsky is nothing to do with science. He hadn't a clue about science. He was a fool. Only an idiot could be impressed by his idiotic ramblings. Which is why the EU dolts seem to base their whole edifice of crapology on his idiocy. Velikovsky correctly predicted a hot Venus, Jupiter's radio emissions, and the SS bodies having electric charges when such phenomena were considered "impossible". As you and Sagan agree, the science community only wants to ignore such facts.